Lift SP - Does Lift SP Work? Question: I saw an ad online for a product called Lift SP Youth Serum. It’s supposed to erase lines and wrinkles on your face and make you look years younger right after you apply it. Can you please let me know if you think the product really works? Answer:The anti-wrinkle treatment Lift SP Youth Serum claims to be a deep-penetrating treatment that will leave your skin soft and wrinkle free in “just a few seconds.” Outlandish claims that the products effects rival those of Botox and Restylane are presented without any substantiated proof in terms of quantifiable wrinkle reduction. The product seems to be distributed by only one website and there is no information provided about the credentials of the developer of the product or the process by which the formula was devised. 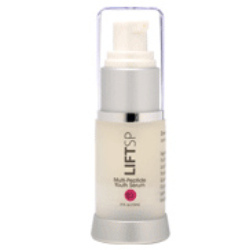 Lift SP Youth Serum is an illusive product in that it is difficult to find any concrete information about what it does and how it does it. The lack of solid information about how the product was developed or the source of the ingredients, plus the cost may make some users downright uncomfortable.